Baby heart rate apps for pregnancy - do they work? 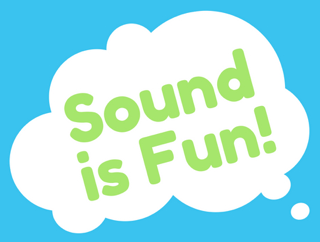 ~ SOUND IS FUN! When I was pregnant, I was fascinated by the gadget my doctor used to listen to our baby’s heartbeat (called a Doppler fetal monitor). When I saw apps that claimed they could detect a baby’s heart rate, I was highly skeptical. As an audio engineer with 2 degrees in sound and 15 years in the field, I didn’t know how it would even be possible for a microphone to pick up sounds deep inside the body. I tested when I was around 17 weeks pregnant at a professional sound studio with over $100k of equipment for my experiment (Tech details are included at the end). At the time, my doctor was still using a Doppler monitor and ultrasound machine to monitor my baby’s heart rate. None of the microphones picked up a heart beat. All I heard in the recording was a lot of my stomach noises. For fun, I tried recording my own heart beat (yes, these are the kinds of activities sound people do during down-time at work). It took a lot of audio processing but I eventually heard a faint heartbeat. The signal was very noisy (there was also breathing, clothes moving, more stomach rumbling… pregnant woman, remember?) but my heartbeat was there. It was not an easy process for a professional audio engineer to capture an adult heart rate with a microphone. It certainly was not as easy as pressing a microphone to the stomach or chest. From there, I tried every baby heart rate monitor app I could find and with no surprise, none of them worked as they claimed. Some apps gave me no reading (which I expected). But others… that’s where things get fun. And scary. There are apps that call themselves a “Fetal Doppler.” Unless you buy a physical fetal doppler that somehow sends a signal to your phone, this claim is 100% false and deceptive. Some apps gave a heart rate reading for my baby. One app even played me a heart beat. The heart rate was totally wrong for the age of my baby (a baby’s heart rate slows down as pregnancy progresses). It also gave me the exact same heart rate when I put it near my heart. It was completely fake. What’s scary about these false readings (especially the fake heart rate) is it could convince a mom nothing is wrong when there is in fact a problem. An app should never be used be used to replace the expertise of a medical professional. When in doubt, see a doctor. The mechanics of a microphone make it impossible to use as a fetal Doppler monitor. Microphones are designed to measure sound wave changes (vibrations) in the air; A Doppler monitor works without air. The reason for using gel with an ultrasound is to help remove air bubbles. A real Doppler monitor works in a completely different frequency range than a microphone. The frequency range most software is designed to pick up is essentially the same as human hearing which is 20Hz-20kHz (20-20,000). A Doppler fetal monitor works at 3MHz (3,000,000). A baby’s heart is hidden behind a lot of physical layers. There’s both mom and baby’s skin and organs. Plus, there’s sounds coming within mom’s body (her own heart beat, blood moving, stomach growling, etc). Because of all of this and the added complication of a tiny baby who might be moving around a lot, it’s not always easy to find a baby’s heart rate using a Doppler fetal monitor (even for a medical professional). A Doppler fetal monitor uses ultrasonic sound waves (higher than humans can hear). The waves pass through skin and are reflected by moving objects (like a baby’s heart). When it reflects from the baby’s heart, the frequency changes. The monitor picks up these changes and “converts” it to frequency that can be heard as a sound wave. The monitor will then amplify the sound wave so it can be heard through a speaker. Typically, an electronic fetal monitor can pick up a baby’s heart rate starting around 10-12 weeks. A stethoscope (which works by detecting vibrations) can’t register a baby’s heart rate til around 18-20 weeks. While we can’t hear ultrasonic frequencies being emitted by a Dopper fetal monitor, babies may hear when the ultrasound is turned on and off. 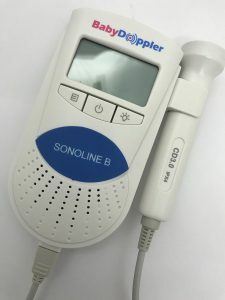 You can buy fetal doppler monitors online (like the Baby Fetal Doppler Monitor with Infrared Night Vision ) but technically these devices are prescription and designed to be used by trained professionals. Always consult your doctor before buying or trying medical equipment. Before electronic monitors existed, doctors used a device called a Pinard Horn to hear a baby’s heart rate (such as the OdontoMed2011® PINARD STETHOSCOPE). These are low cost and might be a good option for parents who choose not to do ultrasounds (some midwives use them, too). But, you may not be able to hear a heart rate til around 20 weeks. I didn’t redo my experiment after 17 weeks so it’s possible a microphone (and an app) could pick up some baby sounds later in pregnancy. However, I’m still highly skeptical these apps will pick up a heart beat as easily as they claim. If you can hear your baby with a phone microphone, you are probably so far along in pregnancy you are feeling (or even seeing) your baby move and kick. Someone could probably put their ear on your stomach and hear the baby at that point. I think these apps are most appealing earlier in pregnancy. There’s weeks where a mom knows there’s a baby in there but can’t feel the baby move much and it’s terrifying at times (this is roughly between 8 weeks and 20 weeks). This is probably the time when a pregnant mom is most likely to want or buy a heart rate monitor for her baby. The problem is during this period, these apps just don’t work. It’s not possible. 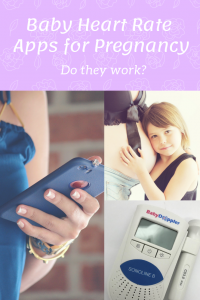 In my own pregnancy experience, I found once I felt movement regularly – around 20 weeks – I didn’t have much desire for a doppler monitor anymore (and I considered buying one). If I wanted to know my baby was ok, I’d just drink some orange juice and wait for the flutters or kicks. If there’s any doubt, a doctor visit is always going to be your best (and safest) way to go. The equipment at the studio I used to test included: GML 8304 mic pre, SSL AWS 948 board (for A/D), then digital signal into Pro Tools. 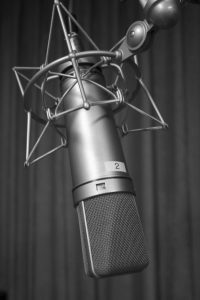 I tested with 4 mic types: Neumann U87 (condenser), Sennheiser ME-66 shotgun mic, Sony ECM-77B (lav), and Audix D2 (dynamic mic). These mics range from $100-$3,000 USD. The audio technology in a mobile device consists of a few parts: Microphone (typically MEMS), analog to digital converter (A/D), headphone amp, speaker. For all of these to fit in a handheld phone, all the components need to be lightweight, small and affordable. What this means is manufacturers are going to pick components based on size, cost, and practical use and not what’s best for sound quality. Because of that, the components in a consumer device (like a cell phone or tablet) will be lower quality than those in professional audio equipment. The cost of components for Android and iPhones is projected to be under $30. That’s for everything. I can’t find data but would guess their microphones cost $5 or less. That alone should be enough to raise skepticism. If $100k of equipment designed to pick up sound can’t pick it up, why would a $5 component work? Microphones can pick up frequencies much higher than 20kHz. The limitation with using those frequencies isn’t the microphone, though. It’s converting from analog to digital (see the Nyquist-Shannon sampling theorem). It also takes DSP to sample higher frequencies (in other words, it takes software memory to record). There’s no reason for consumer products to be taking in these frequencies we don’t hear. I did look into whether mobile devices could send or receive ultrasonic frequencies. I was surprised to find they can and they do. Wired suggested they are being used for tracking purposes.